This fast-paced 250 unit apartment building took us less then 8 months to complete while working through one of the toughest winters in decades. 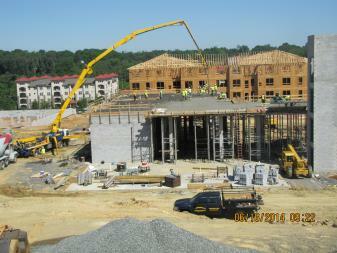 This project again featured over 60,000 Sf of shored transfer slab. Improving on the shoring techniques we learned at Spring Mill we were able to have a two week turn around on our 10,000 SF shoring pours. Left: the use of a ground heater allowed us to continue pouring slabs through the winter. Above: The finished product. 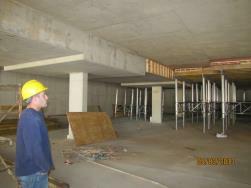 After the transfer slab reaches it compressive strength the shoring can be removed. 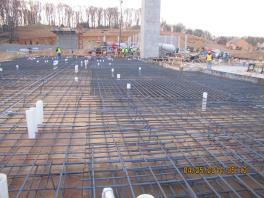 Below: Setting up for a 500 cy transfer slab pour. A new company record. Below: another two-story (24' high) shored slab. 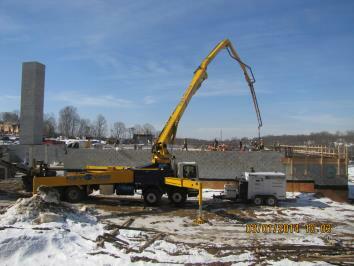 These large pours require the use of our large 42m pump truck.